Interest Rates Are Set To Be Zero Forever – Thankfully P2P Lending Provides a Good Rate of Return by Haven Investor. At the end of last month, following the September 2015 Fed Committee meeting, Janet Yellen – the Fed Governor admitted to reporters that it is not impossible that the Fed might hold interest rates at zero forever within the USA, where they have been for the last 7 years since the emergency measures were put in place during the height of the financial crisis back in 2008. Japan has been living with zero interest rates since 1990 since their debt bubble popped over 25 years ago. Meanwhile, the United Kingdom and European Union have also been living on zero interest rates since 2008 with no serious intention to raise them anytime soon. In fact, within the European continent the problem is even more serious with an ongoing battle against deflation taking place with countries such as Sweden now having negative interest rates imposed on their population, therefore the SAVER effectively take a LOSS EVERY YEAR with the bank by holding their money in their account. The central banks of the world have decided to declare war on prudent savers for the benefit of the risk takers who get into too much debt they cannot hope to pay back. Luckily for savers, there is now a new and exciting alternative to a traditional savings account that can generate a high yielding, low risk source of income – that alternative is: Peer to Peer Lending. What is Peer to Peer Lending? Peer to Peer (P2P) lending, in a nutshell, is individuals lending money to other individuals or businesses without a banking acting as an intermediary between the two parties. 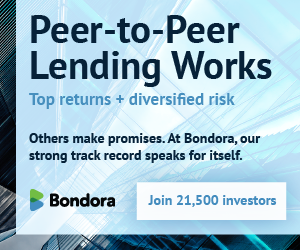 The majority of P2P lending is now done online on a marketplace platform where a borrower by providing their credit information can seek a loan from many anonymous investors. On most platforms, an auction takes place and dependent on the borrowers details the investors bid to lend money at a particular interest rate, with the average final rate being set for the borrower. As the industry continues to grow, there are now many types of loans available for individuals, small to medium businesses, property developers and now even using the digital currency Bitcoin. Benefits of Peer to Peer Lending for the Investors? The most important benefit is the good annualised rate of return, dependent of the level of risk – with a yield of 5% for the lowest risk to 15% for the higher risk customers. Compared to a typical bank account yield of less than 1%, peer to peer lending provides a viable alternative for growing your earned savings. Also, it provides further diversification of your investment portfolio from traditional equities and bonds. Whilst at the same time, contributing to the growth of an economy by funding businesses or individuals. How to Invest in Peer to Peer Lending? It depends on your country of residency and level of experience as an investor. If you are a first time investor in Peer to Peer Lending – we recommend starting with the largest and more established platforms first. Once you found the right peer to peer lending platform for your level of risk and you are ready to invest – we recommend the following tips to increase your level of return whilst reducing your risk. Optimise the automation tools within the peer to peer to invest & reinvest in loans automatically – to save time.